Bhasha SETTdeco is a web service given through a web widget that enables any user to read Sinhala & Tamil Unicode web contents without depending on Sinhala/Tamil support of user's computer. You can simply install SETTdeco widget in your Sinhala/Tamil website or blog & the web service will be automatically provided via the widget. After you install the widget, it detects every time when a user visits your site weather your visitor's computer has Sinhala/Tamil Unicode support or not. If your visitor doesn't have Sinhala/Tamil Unicode support, SETTdeco does the job of decoding & rendering Sinhala/Tamil Unicode contents & displays them to the visitor as it displays in a native Sinhala/Tamil supported computer. In addition to doing the Unicode decoding & rendering, it also informs the user about his computer's Sinhala/Tamil Unicode support & guide him/her to install Sinhala/Tamil Unicode on his/her computer. Even though Sinhala/Tamil is no longer a miracle on the Internet with thanks to Unicode, still a majority of Sri Lankan computer users cannot get the benifit of that, due to various reasons. The main reason is Windows XP OS. Windows XP is the OS that runs on more that 80% of computers in Sri Lanka & unfortunately Windows XP doesn't have Sinhala Unicode support by default, so users have to install it manually. In that case, due to the lack of knowledge on Unicode & how to install/use Unicode, still a majority of Sri Lankan computer users are not able to get the use of local language Unicode websites, blogs & web services provided by the government, individuals & various organizations. This badly affects not only the Sri Lankan Sinhalese & Tamil masses, but also all the local language website owners including the government, individuals & Sri Lankan organizations & companies. Because, even though those bodies provide potential contents & services in local languages, still the number of people they are providing their sevice is very low due to the above mentioned reasons. And also in case of commercial websites, even though Sri Lankan & foreign companies develop local language web sites or localize their existing websites spending a lot of money to reach the masses, they still can only reach a very limited number of the masses due to those reasons. Because of that, some companies even tend to use non-standard & non-acceptable methods to reach the masses such as using images instead of Sinhala/Tamil Unicode text or using non-Unicode fonts, which badly results for their websites, as then those contents become non-searchable by search engines & non-analysable by global analysers like Google for them to provide their services such as Google translation & Google adsense for our local languages, Sinhala & Tamil. Bhasha SETTdeco provides a perfect solution for this problem while letting the website owners use the standard Sinhala/Tamil Unicode for their websites & solving the user side Sinhala/Tamil reading (rendering) issue from a server side solution. Bhasha SETTdeco is simply a web service given through a web widget. Website owners can install SETTdeco widget in their websites & the web service is automatically provided via the widget. After SETTdeco is installed in a particular website, it detects the user (visitor) side Sinhala/Tamil support in each time when a visitor is visiting the site. If it detects that the current visitor has proper Sinhala/Tamil support, SETTdeco does nothing. But if it detects that the current visitor doesn't have Sinhala/Tamil support, SETTdeco does the Unicode decoding & rendering part with the help of the web service & displays the Sinhala/Tamil contents to the visitor accurately with no rendering errors at all. The important thing is, the visitor has to do nothing to read Sinhala/Tamil web content in this way & only the website owners have to install SETTdeco in their websites. Therefore the visitors need not to be aware about Unicode or how to install Unicode to read Sinhala/Tamil web contents & to get the benifit of them. Since SETTdeco supports all major OSs (Windows/Mac/Linux) & major web browsers (Firefox/Chrome/Internet Explorer), visitors from any OS & any browser can read Sinhala/Tamil web contents regardless of they're having Sinhala/Tamil support or not. 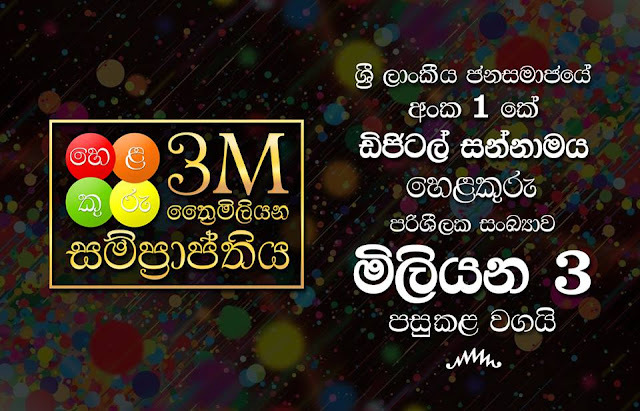 And since SETTdeco automatically detects the visitor's Sinhala/Tamil support & informs that to the visitor with guidelines to install Sinhala/Tamil Unicode on their computers, it is also a great way to educate the masses about Unicode & convince them to install & use Unicode for their day to day work. On the other hand from the website owners' perspective, SETTdeco is also the perfect solution for them. SETTdeco lets the website owners use the standards of developing local language websites or localizing their existing sites, that is using Unicode & that enables them to reach the masses without worrying about the user side Sinhala/Tamil support while sticking with standards to be on search engines to enable the users to easily search the contents of their sites using any search engine like Google. Bhasha SETTdeco provides potential traffic to Sinhala/Tamil websites & blogs. How? Even though site owners develop local language sites or international companies localize their sites to Sinhala/Tamil spending a lot of money, the traffic for those sites is very less since the majority of Sinhalese/Tamil internet users cannot view those sites properly due to the lack of Unicode support of their computers & lack of knowledge on how to install Unicode. But with SETTdeco, site owners no longer have to worry about user side Unicode support as SETTdeco completely looks after that. They can just install SETTdeco on their sites & wait to see the traffic. Bhasha SETTdeco provides readers the ability to read Sinhala/Tamil sites on any environment. Most of the Sinhalese/Tamil internet users are not aware about Unicode & how to install Unicode. Therefore, even though there are lot of contents out there on the web in Sinhala/Tamil, they still cannot get the use of those contents, since they cannot read Sinhala/Tamil sites. But with SETTdeco, site visitors have nothing to do additionally to read Sinhala/Tamil sites & they can read those site as same as they read English sites. Initially Bhasha SETTdeco web service is free for all users & then we are planning to issue domain based licenses for using this service on commercial sites. This service will be Free forever for non-commercial sites & blogs as an encouragement for local language site developers & as to potentially promote local language sites & blogs.